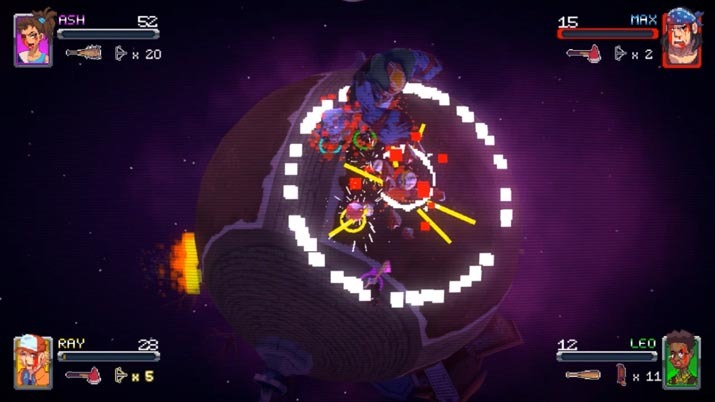 Part Left 4 Dead, part Super Mario Galaxy, Jakarta-based Anoman Studio’s Orbiz shrinks the typical zombie game down to an 80's technicolor top-down shooter, complete with scan lines and funky bass. Orbiz follows the quest of four teenagers making their way through the woods and destroying radioactive piles of junk to stop more and more zombies from spawning and taking over. Even though the gore is cartoony and the zombies are pixelated, the panic and fear of trying to make it out alive before being overrun remains. The overall throwback aesthetic of the low poly models of the characters and environs gives Orbiz its charm. Even for a millennial like myself, playing through the levels brings me back to my early days of marathoning Nintendo 64 and PlayStation titles after school and late into the night. Various visual effects help refine the yesteryear gaming mood: there are random pixelated glitches at the title screen and through the levels, and splashes of SMPTE color bars here and there. The emulated scan lines are endearing, turning the monitor into an old television of sorts. The emulated nostalgia helps build the atmosphere and set the stage for a night of world-travelling zombie killing. However, the graphics tended to get muddled on the darker stages, making it hard to differentiate the characters from the buildings and general environment. If it weren’t for the colored circle my character, it would’ve been a lot harder to keep track of myself. The art style of the varied, almost zany, locations is simultaneously humorous and panic-inducing. While beached sharks chasing after you might seem funny, bloated tapeworms, crawling towards you in the foggy streets of Chinatown, is not. Not when you’re surrounded by flashing barrels, ready to explode at the slightest touch. Cue nervous frenzy and death by explosion. The soundtrack keeps you energized, ready to take on the hordes of zombies encroaching upon your town. The change from the overworld themes to the boss themes maintain the pressure and urgency while still bringing on the 80s jamz-with-a-z, complete with synths and what could be keytar. On the other hand, the mixing of the sound effects may not be on the same level as that of the background music. It’s slightly disappointing that with all of the effort that went into the scoring, the sound effects are hit or miss. What might have been the satisfying drone of an SMG, raining bullets into rotting zombie flesh, ultimately comes across as raindrops on a pie tin. Still, the zombie sounds were on point, and all of the melee items offered a satisfying thwack every time they hit something. But for such a stylized title, the text lacks any meaty flavor, in-game or during loading screens. An opportunity to pay homage to an old classic or even offer basic solid advice is replaced with almost-dummy messages instead. Even if it’s common knowledge to pick up ammo and health when either are low, a screen tip ending with “bla bla bla” nearly betrays the care and effort that went into the title. While there isn’t much to the story of Orbiz, what it lacked in plot, it definitely made up for in gameplay. 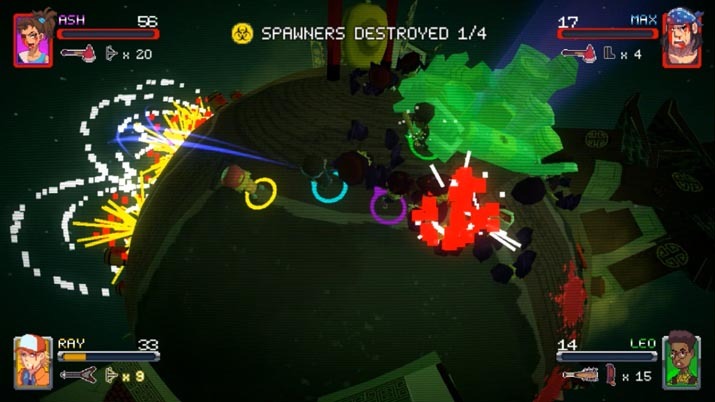 The structure is straightforward: destroy a few spawn points — which flash green, for your convenience — to open up a portal and escape through to the next area until the boss is found and defeated. The ‘tiny world’ aspect was an interesting take on the regular stage, allowing for free movement through space. All the while, zombies sprout from the ground tens at a time, reaching for the nearest human. "Reaching," because, try as some might, several have the tendency to get caught between cars, behind trees, or around the very piles of radioactive spawn stuff from which they emerge. Some even manage to climb on top of the spawn piles, then stop. Because the AI targeting has a predisposition for straight lines, enemies tend to get stuck. I’m not sure if it helps or a hinders, but honestly, it’s a nice breather from the pummeling of endless undead throngs. Orbiz features four characters to choose from, each with his own special skill: speedster Ash, tank Max, heavy-hitter Ray, and ammo stockpiler Leo. Each is tailored for different play styles and offers a different kind of challenge. 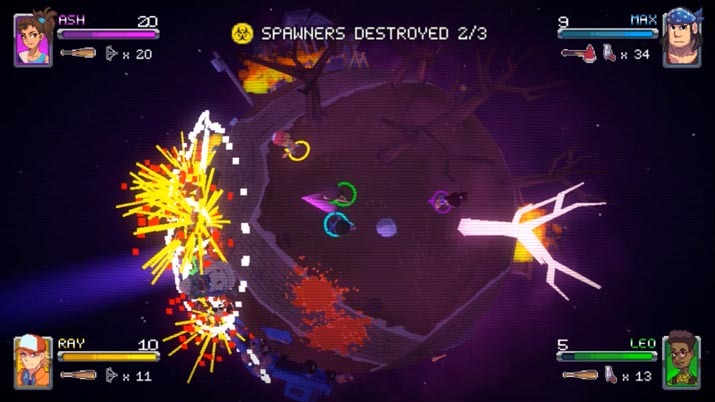 The interplay between their skill sets creates one of the draws of the title: four-player co-op. While you can play solo, the genre lends itself to a “the more, the merrier” play style. Playing with two or more players also allows for the opportunity to revive each other when someone dies, which makes it all the more entertaining when a teammate gets left behind because they’re surrounded by zombies, but the rest of the party can’t move on because everyone has to be on screen together. That said, the difficulty is adjusted per the number of players, so if you go it alone or play with a party, Orbiz is zombie slaughtering mania all around. Though, having played with one other person at a time (as we only had two controllers on hand), the levels were already plenty hard to get through, with various kinds of zombies showcased throughout: spitters that crawled on all fours, bloated boomers that burst when nearby, and oversized tapeworms that shrink in size before finally dying. Weapons are classified into two categories: melee weapons, like nailed baseball bats, axes, and electric guitars; and guns, like revolvers, shotguns, and crossbows. Like the protagonists, each has its own advantages and disadvantages. Because the details weren’t laid out, there was some guesswork involved in trying to decide the effectiveness of each one. We didn’t have the time to carefully test which ones do the most do the most damage or are the fastest to use, so it would’ve been nice to have a guide... of course, one could argue that in the midst of a zombie apocalypse, one might not have the luxury of analyzing the best weapon. Perhaps the best choice is melee weaponry, since we had trouble with aiming guns. While the tutorial had mentioned that it was possible to aim with the mouse or the right joystick on a gamepad, characters only shoot in the direction they are facing, regardless of where the reticule is positioned. There also only seemed to be one reticule between multiple players, all of which ultimately forced us to simply shoot straight ahead. It honestly wasn't that big of a deal, as it wasn’t too obstructive, but it was a noticeable issue.